This homemade costume for families entered our 2017 Halloween Costume Contest, and won 2nd place in the Best Family Costume nomination! This was the first time we had decided to dress up as a family. Since we were all on board, we just had to choose the costumes. We knew that it should be something different and unique. We wanted something that would be somewhat silly and not too scary. 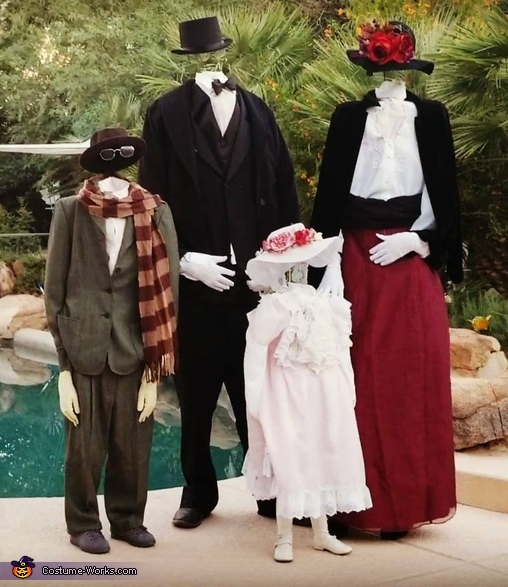 We had heard of the invisible man street performers and thought it would be awesome to create an "invisible family". It seemed no one else had done it (from what we could find online) and it would be a fun challenge that we could all take part in. These costumes were created through a lot of trial and error. Ultimately we ended up settling on frames created from backpacks with an attached piece of cardboard that came up and bent over our heads like a shelf to create the shoulders. This also created distance between our faces and the fabric. We used wire from coat hangers to weave through the cardboard to give it extra support. Wire is also supporting the hats. We used clothes from thrift stores for all of the costumes and went for a very early 1900's style. We were able to see through the sheer fabric of the white shirts. The reactions we received were the best part. People were totally baffled by the costumes and we received tons of nice compliments all night long. The costumes turned out to be a complete hit and won the costume contest at festival we attended. People stopped us constantly for pictures. We felt famous for a night! It was a lot of fun for our whole family.